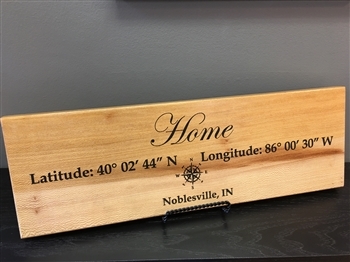 Our custom coordinates latitude and longitude signs liven up your home's decor. Made of solid sycamore, we use a 5-step process that ensures you receive a quality sign. Measures 23" X 6" X .75"
4. Your personalized sign is color-filled add eye popping contrast. Every sign is handcrafted in our Indiana shop using both old-world woodworking skills and modern CNC technology to produce a custom-made sign that is individually yours...and yours alone. Measures: 23" x 6" x .75"